Report after report, same old, same old: Android and iOS continue to kick everyone’s arse in the mobile market. The latest comScore report is out, and once again, these two remain the only ones gaining any market share. Android continues to lead the pack with 48.6% (up 2.3 percentage points) while iOS remains in second with 29.5% (up 1.4 percentage points). 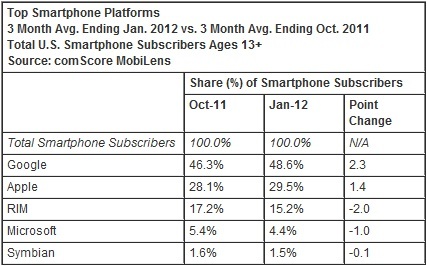 Everyone else continues to lose market share with RIM holding the third position at 15.2% (down 2 percentage points. After that it’s Microsoft with 4.4% (down 1 percentage point) followed by Symbian with 1.5% (down .1 percentage point). Overall Android and iOS occupy 78.1% of the market with no signs of slowing down. On the OEM front, Samsung continues to hold the top spot with 25.4% of market share while LG and Motorola remain in second and third. Apple still holds the fourth spot and is the only OEM to gain any market share over the three month reporting period — up 2 percentage points. Well, that does it for the latest comScore report, nothing much has changed — Android and iOS continue to dominate while everyone else fights for scraps. If you’d like more information concerning the comScore reports, follow the source link below.